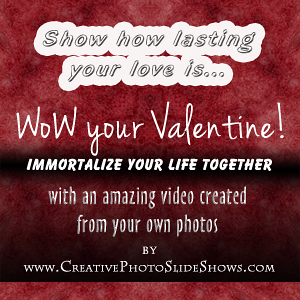 Looking for an outstanding and memorable Valentine's Day gift? How about one of our custom Sweetheart video shows? Enjoy watching it on your smartphone, tablet, computer, or television, anytime, anywhere, over and over! YOU'LL LOVE WATCHING IT TOGETHER AND SEPARATELY!